Vascular anomalies are localized defects of the blood or lymphatic vasculature that arise during embryonic development and are typically observed at birth or soon after. They are classified into vascular tumors, which are proliferative masses that grow rapidly; and vascular malformations that grow proportionately with the individual and are classified by the type of vessel(s) affected: capillary, venous, arterio-venous, lymphatic or combined malformations. Vascular tumors consist mainly of infantile hemangioma (IH), a common benign tumor that arises in about 10% of neonates, mostly in the area of the head and neck. It proliferates rapidly over the first year of life, then undergoing a period of gradual and spontaneous regression over a period of several years to be replaced by a fibro-fatty deposit. Congenital forms of hemangioma that regress rapidly (rapidly involuting congenital hemangioma or RICH) or fail to regress at all (non-involuting congenital hemangioma or NICH) are also known, and hemangioma can also occur in the context of broader syndromes such as PHACES (Posterior fossa malformations, hemangiomas, arterial anomalies, cardiac defects, eye abnormalities, sternal cleft and supraumbilical raphe syndrome). Rare familial forms of IH suggest that genetic factors can play a role in pathogenesis. Little is known about the genes that cause these tumors, however, or the molecular mechanisms that trigger their regression. In a collaborative study, we demonstrated that hemangioma endothelial cells are characterized by chronic activation of VEGFR2 signaling. In certain cases, this is due to missense variants in the genes encoding the VEGFR2 or ANTXR2/TEM8 receptors (Jinnin et al, 2008). Themajority of IH samples do not carry these changes; in addition, while significantly enriched in patients, they are nevertheless also found in healthy individuals. Thus, hemangioma is a genetically complex, heterogeneous disease. We harness samples from rare familial cases in order to identify gene-variants that co-segregate with disease. We also assess for strong (intra-genic or chromosomal) mutational events in syndromic patients with hemangioma. We then test these same genes in the blood and tissue of patients with isolated, sporadic IH (the most common form) for germline changes with potentially weaker effects on protein function, or strong somatic mutations, that contribute to disease. Jinnin M, Medici D, Park L, Limaye N, Liu Y, Boscolo E, Bischoff J, Vikkula M, Boye E, Olsen BR. Suppressed NFAT-dependent VEGFR-1 and constitutive VEGFR2 signaling in infantile hemangioma. Nat. Med. 2008; 14(11): 1236-1246. Venous anomalies occur in two distinct flavors: glomuvenous malformations (GVMs) that account for less than 5%, and venous malformations that represent the majority (95%). While both affect veins, they are clinically and genetically distinct disorders (Boon et al, 2004). We discovered that GVMs, which are almost always autosomal dominantly inherited, are caused by loss-of-function mutations in the Glomulin (GLMN) gene (Brouillard et al, 2002 & 2013). These germline, heterozygous mutations are accompanied by somatic “2nd hit” mutations that inactivate the wild-type allele: thus, lesions arise due to a localized, complete lack of functional protein (Brouillard et al, 2002). This seems to derail vascular smooth muscle cell (vSMC) development, resulting in the accumulation of irregularly distributed, rounded “glomus” cells around distended venous channels (McIntyre et al, 2004). Intriguingly, the somatic 2nd hit is most often an acquired uniparental isodisomy of chromosome 1p, on which glomulin is located (Amyere et al, 2013). We are now studying the role of GLMN in the vascular system using conditional, vascular-specific knock-out and knock-down mouse models to recapitulate the human disease (Nguyen et al, unpublished). Venous malformations (VMs) are distended veins lined with a single endothelial cell (EC) layer surrounded by sparse, irregularly distributed vSMCs. A rare, autosomal dominant inherited form, cutaneomucosal venous malformation (VMCM; 1-2%) is caused by activating mutations in TIE2/TEK, the endothelial cell tyrosine kinase receptor for the Angiopoietins (ANGPTs) (Vikkula et al, 1996). In lesions from two patients, we have found evidence for somatic 2nd hit mutations in TIE2 (Limaye et al, 2009, & unpublished). Somatic TIE2 mutations also cause common unifocal sporadic VM, as well as the rare, severe Blue Rubber Bleb Nevus (BRBN) syndrome (Limaye et al, 2009, Soblet et al 2013, Soblet et al In Prep). The clinical distinctions between the different TIE2-associated venopathies are underlined by differences in “signature” mutations as well as mutational mechanisms observed. We are now studying the similarities and differences in the effects of these mutations on endothelial cells, in order to understand why they cause distinct phenotypes. This will tell us whether all VMs are likely to be effectively treated using the same strategies, or whether they will warrant personalized therapies. In this context, we have found that the PI3K/AKT pathway is activated by all of the TIE2 mutant forms studied, making it an attractive therapeutic target. Indeed, inhibition of this circuit using the mTOR inhibitor rapamycin (sirolimus) has proven to be effective at controlling lesion growth in a mouse model of VM, as well as in patients with severe disease (Boscolo et al, 2016). This has led to the establishment of a clinical trial under the aegis of Prof Laurence Boon at the Vascular Anomalies Center at Cliniques St. Luc, U.C.L. (contact/link). While it ameliorates pain and VM-associated coagulopathy, rapamycin does not seem to eliminate VMs. In addition, long-term use is associated with significant side-effects, making the identification of alternative targets an urgent goal in the lab. Boscolo E, Limaye N, Huang L, Kang KT, Soblet J, Uebelhoer M, Mendola A, Natynki M, Seront E, Dupont S, Hammer J, Legrand C, Brugnara C, Eklund L, Vikkula M, Bischoff J, Boon LM. Rapamycin improves TIE2-mutated venous malformation in murine model and human subjects. J Clin Invest. 2015 Sep;125(9):3491-504. Amyere M*, Aerts V*, Brouillard P*, McIntyre BA, Duhoux FP, Wassef M, Enjolras O, Mulliken JB, Devuyst O, Antoine-Poirel H, Boon LM, Vikkula M. Somatic Uniparental Isodisomy Explains Multifocality of Glomuvenous Malformations. Am. J. Hum. Genet. 2013; 92(2):188-96. Brouillard P, Boon LM, Mulliken JB, Ghassibé M, Warman ML, Tan OT, Olsen BR, Vikkula M. Mutations in a novel factor glomulin are responsible for glomuvenous malformations (« glomangiomas »). Am. J. Hum. Genet. 2002; 70:866-874. Brouillard P, Boon LM, Revencu N, Berg J, Dompmartin A, Dubois J, Garzon M, Holden S, Kangesu L, Labrèze C, Lynch S, McKeown, Quere I, Syed S, Vabres P, Wassef M, Mulliken JB, Vikkula M and the GVM-study group. Genotypes and phenotypes of 162 families with a mutation in GLMN. Mol. Syndromol. 2013; 4(4):157-164. Limaye N, Wouters V, Uebelhoer M, Tuominen M, Wirkkala R, Mulliken JB, Eklund L, Boon LM, Vikkula M. Somatic mutations in the angiopoïetin-receptor TIE2 can cause both solitary and multiple sporadic venous malformations. Nat. Genet. 2009; 41(1):118-124. McIntyre BA, Brouillard P, Aerts V, Gutierrez-Roelens I, Vikkula M. Glomulin is predominantly expressed in vascular smooth muscle cells in the embryonic and adult mouse. Gene Expr. Patterns, 2004; 4(3):351-358. Soblet J, Limaye N, Uebelhoer M, Dompmartin A, Vanwijck R, Boon LM, Vikkula M. Variable somatic TIE2 mutations in half of sporadic venous malformations. Mol. Syndromol. 2013; 4:179-183. Uebelhoer M, Nätynki M, Kangas J, Nguyen H, Soblet J, Mendola A, Godfraind C, Boon LM, Eklund L, Limaye N* and Vikkula M*. 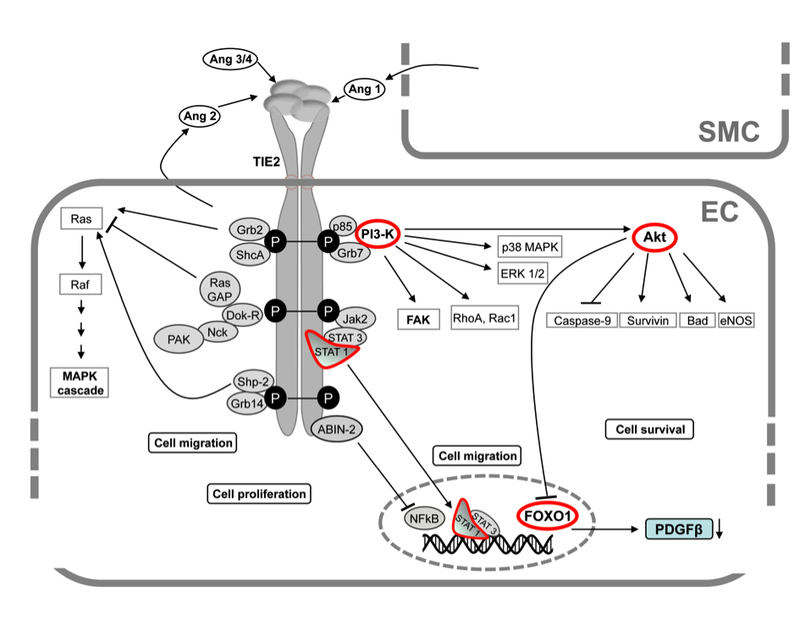 Venous malformation-causative TIE2 mutations mediate an AKT-dependent decrease in PDGFB. Hum. Mol. Genet. 2013; 22(17):3438-3448. (*Equal contribution). Vikkula M, Boon LM, Carraway III KL, Calvert JT, Diamonti AJ, Goumnerov B, Pasyk KA, Marchuk DA, Warman ML, Cantley LC, Mulliken JB, Olsen BR. Vascular dysmorphogenesis caused by an activating mutation in the receptor tyrosine kinase TIE2. Cell. 1996; 87(7):1181-90. Wouters V*, Limaye N*, Uebelhoer M, Irrthum A, Boon LM, Mulliken JB, Enjolras O, Baselga E, Berg J, Dompmartin A, Ivarsson SA, Kangesu L, Lacassie Y, Murphy J, Teebi AS, Penington A, Rieu P, Vikkula M. (2010) Hereditary Cutaneomucosal Venous Malformations Are Caused by TIE2 Mutations with Widely Variable Hyper-phosphorylating Effects. Eur. J. Hum. Genet. 2010;18(4): 414-420. (*Equal contribution). Capillary malformation (CM), also widely known as “port-wine stain”, is the most common vascular malformation, with an incidence of 0.3%. It is present at birth and most often occurs as an isolated homogenous pink lesion that becomes darker and thickens with time, when located in the face. Some CMs are inherited, and some are part of a syndrome, as in Klippel–Trenaunay, Sturge–Weber, Parkes Weber, or CLOVES syndromes. We were able to unravel heterozygous mutations in the RASA1 gene (MIM #139150) in several families with inherited, multiple CMs in association with fast-flow vascular malformations [Eerola et al., 2002 & 2003]. They can be distinguished from the punctate, radiating, or arborizing telangiectatic lesions of hereditary benign telangiectasia and hereditary hemorrhagic telangiectasia, two autosomal-dominant conditions with different management [Revencu et al., 2008 &2013]. RASA1 encodes P120RASGAP. This protein acts as a negative regulator of the RAS signal transduction pathway, by enhancing the weak intrinsic GTPase activity of normal RAS p21. Somatic mutations in GNAQ have been associated with apparently non syndromic CM and Sturge–Weber syndrome (MIM #185300), a rare sporadic neurocutaneous syndrome frequently characterized by vascular malformation in the leptomeninges. GNAQ encodes for G-alpha-q, a G-protein subunit that is involved in intracellular downstream signaling of MAPKs and Phospholipase C. We are interested in identification of new CM–AVM causal genes and study of pathogenesis of CM-AVM. Unique and large cohorts have been collected for the study. Eerola I, Boon LM, Watanabe S, Grynberg H, Mulliken JB, Vikkula M. Locus for susceptibility for familial capillary malformation ('port-wine stain') maps to 5q. Eur. J. Hum. Genet. 2002;10:375-80. Eerola I, Boon LM, Mulliken JB, Burrows PE, Dompmartin A, Watanabe S, Vanwijck R, Vikkula M. Capillary Malformation-Arteriovenous Malformation, a heretofore undescribed clinical and genetic entity, is caused by RASA1 mutations. Am. J. Hum. Genet. 2003; 73:1240-9. Boon, L.M., Mulliken, J.B. & Vikkula, M. RASA1: variable phenotype with capillary and arteriovenous malformations. Curr. Opin. Genet. Dev. 2005; 15:265-9. Vikkula M. Vascular pathologies. Angiogenomics: towards a genetic nosology and understanding of vascular anomalies. Eur. J. Hum. Genet. 2007; 15:821-2. Revencu N, Boon LM, Mulliken JB, Enjolras O, Cordisco MR, Burrows PE, Clapuyt P, Hammer F, Dubois J, Baselga E, Brancati F, Carder R, Quintal JM,Dallapiccola B, Fischer G, Frieden IJ, Garzon M, Harper J, Johnson-Patel J, Labrèze C, Martorell L, Paltiel HJ, Pohl A, Prendiville J, Quere I, Siegel DH, Valente EM, Van Hagen A, Van Hest L, Vaux KK, Vicente A, Weibel L, Chitayat D, Vikkula M. Parkes Weber syndrome, vein of Galen aneurysmal malformation, and other fast-flow vascular anomalies are caused by RASA1 mutations. Hum. Mutat. 2008;29:959-65. Revencu N, Boon LM, Mendola A, Cordisco MR, Dubois J, Clapuyt P, Hammer F, Amor DJ, Irvine AD, Baselga E, Dompmartin A, Syed S, Martin-Santiago A,Ades L, Collins F, Smith J, Sandaradura S, Barrio VR, Burrows PE, Blei F, Cozzolino M, Brunetti-Pierri N, Vicente A, Abramowicz M, Désir J, Vilain C, Chung WK, Wilson A, Gardiner CA, Dwight Y, Lord DJ, Fishman L, Cytrynbaum C, Chamlin S, Ghali F, Gilaberte Y, Joss S, Boente Mdel C, Léauté-Labrèze C, Delrue MA, Bayliss S, Martorell L, González-Enseñat MA, Mazereeuw-Hautier J, O'Donnell B, Bessis D, Pyeritz RE, Salhi A, Tan OT, Wargon O, Mulliken JB, Vikkula M. RASA1 mutations and associated phenotypes in 68 families with capillary malformation-arteriovenous malformation. Hum. Mutat. 2013; 34:1632-41. Revencu N, Boon LM, Dompmartin A, Rieu P, Busch WL, Dubois J, Forzano F, van Hagen JM, Halbach S, Kuechler A, Lachmeijer AM, Lähde J, Russell L, Simola KO, Mulliken JB, Vikkula M. Germline Mutations in RASA1 Are Not Found in Patients with Klippel-Trenaunay Syndrome or Capillary Malformation with Limb Overgrowth. Mol. Syndromol. 2013; 4:173-8. Arteriovenous malformations (AVMs) are rare fast-flow anomalies that are often symptomatic when in the central nervous system, but which also occur in skin and other organs. AVMs are the most dangerous vascular malformations and extremely difficult to treat. They are present at birth and can remain quiescent for years. While most are sporadic, some are associated with autosomal dominant disorders, such as hereditary hemorrhagic telangiectasia, PTEN hamartoma tumor syndrome, and capillary malformation–arteriovenous malformation (CM-AVM). Although important advances have been made in the diagnosis and treatment of arteriovenous malformations, the pathogenic mechanisms remain poorly understood. The identification of the underlying genetic mutations in AVMs is crucial to better understand the pathophysiologic mechanisms in AVM development, and to discover novel therapeutic targets. A first clinical trial is ongoing at Centre for Vascular Anomalies. Boon, L.M., Mulliken, J.B. & Vikkula, M. RASA1: variable phenotype with capillary and arteriovenous malformations. Curr. Opin. Genet. Dev. 15, 265-9. Revencu N, Boon LM, Mulliken JB, Enjolras O, Cordisco MR, Burrows PE, Clapuyt P, Hammer F, Dubois J, Baselga E, Brancati F, Carder R, Quintal JM,Dallapiccola B, Fischer G, Frieden IJ, Garzon M, Harper J, Johnson-Patel J, Labrèze C, Martorell L, Paltiel HJ, Pohl A, Prendiville J, Quere I, Siegel DH, Valente EM, Van Hagen A, Van Hest L, Vaux KK, Vicente A, Weibel L, Chitayat D, Vikkula M. Parkes Weber syndrome, vein of Galen aneurysmal malformation, and other fast-flow vascular anomalies are caused by RASA1 mutations. Hum. Mutat. 2008; 29: 959-65. Revencu N, Boon LM, Mendola A, Cordisco MR, Dubois J, Clapuyt P, Hammer F, Amor DJ, Irvine AD, Baselga E, Dompmartin A, Syed S, Martin-Santiago A,Ades L, Collins F, Smith J, Sandaradura S, Barrio VR, Burrows PE, Blei F, Cozzolino M, Brunetti-Pierri N, Vicente A, Abramowicz M, Désir J, Vilain C, Chung WK, Wilson A, Gardiner CA, Dwight Y, Lord DJ, Fishman L, Cytrynbaum C, Chamlin S, Ghali F, Gilaberte Y, Joss S, Boente Mdel C, Léauté-Labrèze C, Delrue MA, Bayliss S, Martorell L, González-Enseñat MA, Mazereeuw-Hautier J, O'Donnell B, Bessis D, Pyeritz RE, Salhi A, Tan OT, Wargon O, Mulliken JB, Vikkula M. RASA1 mutations and associated phenotypes in 68 families with capillary malformation-arteriovenous malformation. Hum. Mutat. 2013; 34, 1632-41. Lymphatic malformations are congenital, localized, cystic lesions that slowly develop with the growth of the child. Some disappear due to an infection. Current treatments are limited to sclerotherapy, surgical resection or debulking. LMs are almost exclusively sporadic. Their etiopathogenesis is unknown. LMs can also be part of a syndrome, mostly overgrowth syndromes (Brouillard et al, 2014). In syndromic patients with congenital lipomatous overgrowth, vascular (lymphatic) malformations, epidermal nevi, and skeletal/spinal abnormalities syndrome (CLOVES), somatic activating mutations were identified in PIK3CA. Brouillard P, Boon LM, Vikkula M. Genetics of lymphatic anomalies. J. Clin. Invest. 2014; 124(3):898-904. Maffucci syndrome (MS) is a rare congenital disorder characterized by multiple central cartilaginous tumors (enchondromas) in association with cutaneous spindle cell hemangiomas. These patients have a high incidence of malignant transformation. No familial case is known and the etiopathogenic cause remains unknown. In enchondromatosis (Ollier disease, OD), which is comprised of enchondromas only, 4 mutations in the PTHR1 gene have been identified in 4 patients; 3 were somatic and 1 was germline. No PTHR1 mutations have been detected in MS, whereas somatic IDH1 and, more rarely, IDH2 mutations have been observed in 77% of patients with MS and 81% of patients with OD (Pansuriya et al, 2011). These genetic alterations are shared with other tumors, including glioma, leukemia and carcinoma. To unravel the cause of Maffucci syndrome, we have used Affymetrix SNP chips to look for copy number changes in the genome of 11 samples. The most frequent alterations were detected in 2p22.3, 2q24.3 and 14q11.2, which define new loci for this disorder (Amyere et al, 2014). We are interested to identify, the causative gene of Maffucci Syndrome and to study the pathogenesis of this disease. Our clinical collaborators have successfully managed a CLOVES patient from whom we received several tissue samples and excluded mutations in PTEN, AKT1 and TIE2 (Ballieux et al, 2013). Amyere M, Dompmartin A, Wouters V, Enjolras O, Kaitila I, Docquier PL, Godfraind C, Mulliken JB, Boon LM, Vikkula M. Common somatic alterations identified in maffucci syndrome by molecular karyotyping. Mol. Syndromol. 2014; 5(6):259-67. Pansuriya TC, van Eijk R, d'Adamo P, van Ruler MA, Kuijjer ML, Oosting J, Cleton-Jansen AM, van Oosterwijk JG, Verbeke SL, Meijer D, van Wezel T, Nord KH, Sangiorgi L, Toker B, Liegl-Atzwanger B, San-Julian M, Sciot R, Limaye N, Kindblom LG, Daugaard S, Godfraind C, Boon LM, Vikkula M, Kurek KC, Szuhai K, French PJ, Bovée JV. Somatic mosaic IDH1 and IDH2 mutations are associated with enchondroma and spindle cell hemangioma in Ollier disease and Maffucci syndrome. Nat Genet. 2011; 43(12):1256-61. Ballieux F, Modarressi A, Hammer F, Clapuyt Ph, Docquier P-L, Godfraind C, Feyaerts A, Brouillard P, Vikkula M, Boon LM. Reconstructive surgery in the management of a patient with CLOVES Syndrome. J. Plast. Reconstr. Aesthet. Surg. 2013; 66(12):1813-5.